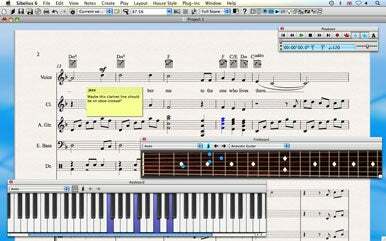 With the latest version of its Sibelius music notation software, Avid hopes to cut score preparation time in half. Sibelius 6, unveiled Tuesday, introduces a number of features aimed at boosting efficiency and making it easier to collaborate. Leading the parade of changes introduced in the new version is a Magnetic Layout feature that automatically spaces and lays out scores from the start, saving users from having to make manual adjustments. ReWire support makes it easier to incorporate audio tracks into notation projects by synchronizing Sibelius with Pro Tools or other digital audio workstations. Enhancements aimed at educators include a Versions feature that lets teachers track student progress, mark changes, and spot plagiarism. New keyboard and fretboard windows let students follow lighted key and finger positions during playback. Finally, classroom control features in Sibelius 6 offer a single window for common classroom management tasks. The calendar embedding app formerly known as Desktop Remind has a new name, a new icon, and new version. HashBang Industries on Tuesday unveiled iDeskCal 2.0, a rebranding of the utility it had bought from Code Genocide. 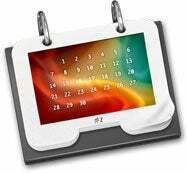 iDeskCal lets users embed their iCal calendar directly onto the desktop, above their wallpaper but below desktop items. That allows users to see their schedule at a glance. iDeskCal users can add events to the calendar via keyboard shortcuts and manage to-do lists through the app. Dejal Systems on Tuesday released version 1.3 of its Caboodle organizational utility for text, images, and other content. The update adds a Save PDF To Caboodle item in the printing workflows; the ability to import PDF files; export options for Web Archive and HTML; an option to include or exclude the creation and modification dates, Subject, and/or custom fields when printing and exporting; and fixes several bugs.